They were quite as plentiful as last time and they were definitely younger and smaller. 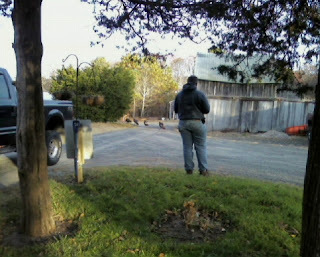 No matter their size, I just think wild turkeys are the most bizarre creatures! They are so prehistoric looking. I always feel like I'm looking at dinosaurs when I look at them. They paid us a visit the other morning, just as we were both leaving. They didn't seem too fazed by us and since there were no males, nobody got all puffed up and aggressive. K-ster has an app on his phone for animal calls, so he played the turkey call. I figured it was so digitized they wouldn't even know. It was intriguing. 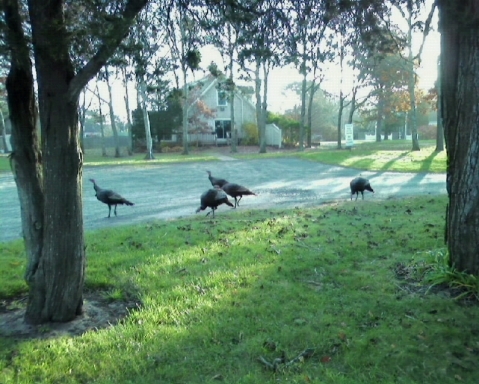 They didn't immediately react, but they started making noises and moving toward the sound. He played it a few times. 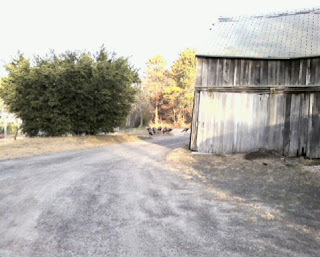 THen he was like the pied piper, ushering the turkeys down the lane. Everyone wants to know if he got one. You cannot shoot females. 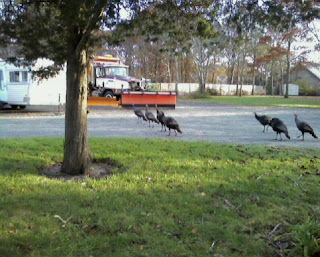 Plus, it's way too easy when they are dining right in your driveway. And he's too much of a softy to really kill one. I'm pretty sure. Besides, who shoots a turkey at 7:30 and then hops in the truck to go to work?? ?